The latest issue of Harvard Business Review features an article “The Darwinian Workplace” on promoting healthy competition in the workplace that I co-authored. The key message of the article is based on several research projects with highly innovative technology companies that implemented tournaments among its workers to increase worker productivity and, at the same time, to increase firm’s profitability. Competition in high-end jobs in industries ranging from movie making to professional athletes to politics is nothing new but can the same principles be applied in industries as mundane as retail, call centers and restaurants, which usually employ minimal-wage workers, with minimal motivation and incentives to work hard? Labor costs in these industries typically represent the largest operating expense and the number of people employed constitutes a significant proportion of population of any developed country. Yet, there are few success stories when it comes to improving productivity of this huge labour force. However, a wave of innovative companies is changing this status quo, and in my research and consulting I had an opportunity to analyse data from such companies and see effects of workplace competition first hand. In my mind, these companies are excellent examples of the Business Model Innovation. In the US restaurant industry alone, almost 13 millions of workers (most of them paid close to minimal wage) provided $580B of meals in 2010. Various workforce management software products attempt to simplify this task by forecasting demand for work and scheduling supply of employees. 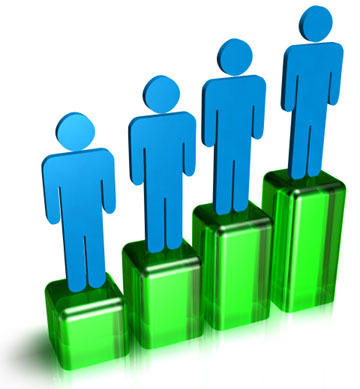 In comparison with traditional organizations that strive to distribute work among employees in identical positions evenly, the winners-take-all organization allocates work along the performance hierarchy, starting from the top and letting each subsequent worker to cut as big a piece of the work pie as he or she can handle. The key difference here is that a traditional organization plans its workload with the average performer in mind, while the winners-take-all organization constantly raises the performance bar above the current average. The key to adopting this approach to workforce management lies in recognition of the fact that workers dramatically differ in their productivity due to skills or abilities or attitude to work, and these differences often cannot be diagnosed at the time of hiring a person. This is exactly what a startup company Objective Logistics Inc. achieves by measuring worker performance in real time. The screenshot below demonstrates what each employee sees after logging into web-based system using, for instance, an iPhone. 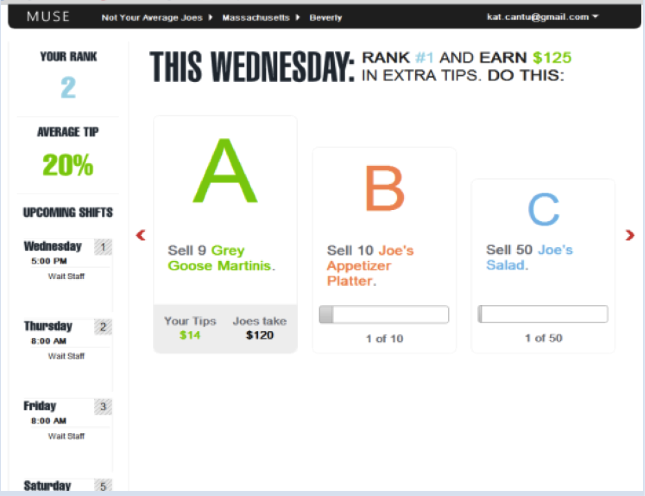 Servers can clearly see their current rank (based on past sales and customer satisfaction captured through tips), they know what they can do to improve, and of course they have the choice of upcoming shifts which depend on their ranking. Perform well and earn the opportunity to work at the busiest times like Friday or Saturday evening, which are also associated with best tips. If you would like to experience the system for yourself, the chain of Boston-based restaurants Not Your Average Joe’s is implementing the system right now and the HBR article contains interviews with the CEO of the chain as well as interview with an employee. The system works – by having best employees work at best times, the restaurant increases its revenues and best employees receive better tips, all essentially at no extra cost! Another company in the article is LiveOps Inc., an innovative call center company which processes streams of inquiries and purchase orders generated from infomercials broadcast by the LiveOps’s clients on cable television. LiveOps provides call center sales services through its hosted technology platform and its community of about 20,000 agents located all over the US who work as independent contractors from home by processing inquiries and orders over the phone using the Internet to log transactions. The distinguishing feature of the LiveOps is the proprietary performance-based work allocation system that turns the company into an ideal example of our “winners-take-all” organization. The firm has a platform technology that allows clients to evaluate an agent’s performance across a range of call performance metrics, such as: the conversion rate which equals to the percentage of calls ended in sales, the average size of the order on sale calls, and the average call time. An incoming call is routed to the best available agent for that product among those agents who have scheduled themselves to work during the current 30-minute block through the scheduling system. Because agents get visibility to their own ranking for each product they sell, they are motivated to improve any particular unsatisfactory score or sign up for the programs and calling times when the products for which they are highly ranked are presented in the infomercial. Those who cannot meet client program performance metrics earn little in compensation, because they are routed fewer calls and sales programs are commission based, paying agents only when they successfully close a sale. Although the average utilization rate of agents at LiveOps is lower than at a “traditional” call center (55% vs 66.4%), the utilization rate of high performing agents is much higher than the utilization rate of low performing agents (70% vs 30%), allowing LiveOps to achieve higher sales at a lower cost.